NOT AVAILABLE FOR ONLINE PURCHASE. Contact VIP Scooters at (540) 574-0215 for more information. VIP Scooters now has the widest range of stairlifts in company history. We now have two different brands, and each of the brands has several models to choose from to fit any need. 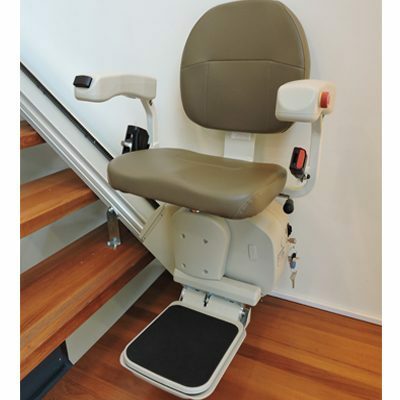 We now carry Handicare USA and Merits Health Products stairlifts. We do residential stairlifts, as well as, commercial stairlifts big and small. If you are considering purchasing a stair lift for your home or business, call us today at 540-574-0215 from a free estimate. If you live within the Harrisonburg, Rockingham County, or surrounding area, you are open to a free in home estimate. See images and specifications below for some of the many options were carry. Along with the many products and services we offer. Stair lifts could possibly be the most the essential piece of assistive technology to help you enjoy the home you love. Can more than one person use the stair lift? Yes, but not at the same time! So long as both users are within the weight limit (safe working load.) – The stairlift weight limit should be indicated on the lift carriage. If in doubt check with the manufacturer or retailer. How easy is the stair lift to use? 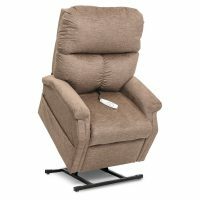 Very, simply pressing on the joystick controller, located on the armrest, or using one of the two remotes (included with every stair lift), in direction of travel and you move off steadily and smoothly. What if something gets in the way of the stairlift? The lift has numerous safety sensors, which automatically stop the lift if anything is detected in its path. What happens if the lift has been left upstairs and I am downstairs? This is a common occurrence when two or more members of a household use the stairlift. The lifts are supplied with two hand held or wall-mounted remote controls. By, simply, pressing the remote control, the lift will be called up or down stairs. Will I still be able to use the stairs as normal? Yes, when not in use the lift can be folded away to allow the staircase to be used by other people and visitors. Is it difficult to get on and off the lift? No, the seat design swivels to allow you to get onto the lift safely at the top of the stairs. 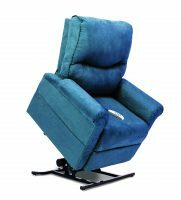 This enables you to alight onto the landing, without twisting your body. If there is room, an overrun can take you clear of the stairwell. How comfortable is it to ride a stairlift? How comfortable a ride will depend upon the model you purchase and any specific physical conditions that may be affected. The MediTek range, for example, incorporates a specific motor to ensure a smooth start and stop and gentle ride. 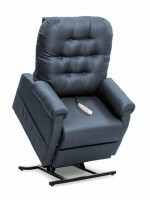 In addition the seat is ergonomically styled and incorporates padding and cushioning. How will I learn how to use the stairlift? Following installation you should also be given an in-depth demonstration of comfort and safety features, as well as a comprehensive list of checks before the engineer leaves so you can get to know your lift. In addition you should also receive a comprehensive user manual. We are located at 141 S Carlton Street, Harrisonburg, VA, next to Big Lots in the Cloverleaf Shopping Center, right off of Interstate 81 exit 247B. Directions from I-81 (North & South Bound): Take the Harrisonburg 247 B exit. Go through 2 stop lights, make a LEFT at the 3rd light onto South Carlton Street. Take the 2nd entrance into the Cloverleaf Shopping Center, and VIP Scooters is on the corner. Optional Additions: Hinge/Sliding Track & Body Harness (available for Handicare units, must ask specifically for this addition) for safer transport, some units come with a range of color options. Copyright © 2003 - 2014 VIP Scooters & Mountain View Product Marketing, Inc.